Not all pumpkin seeds are roasted equally. In fact, there are a few tricks to the trade, said Avila chef Rodney Murillo. That’s good news in homes where roasted pumpkin seeds are as much an autumn tradition as apple picking and leaf peeping. 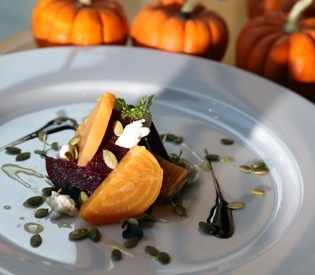 Murillo uses roasted pumpkin seeds in a yellow beet and goat cheese salad he makes each autumn. But the seeds are delicious eaten by themselves. Run the seeds under cold water several times to wash off any clinging pumpkin flesh. Pat the seeds dry with paper towels. Leave the seeds out overnight to dry completely. Preheat the oven very low, about 175 degrees. Bake the seeds in a nonstick pan for 45 minutes, frequently mixing them around so that they cook evenly. While the seeds are roasting, take a generous amount of sea salt and grind it finely with a mortar and pestle or in a coffee grinder. Immediately move the seeds to a room-temperature pan so that they stop cooking. Quickly sprinkle with finely ground sea salt while seeds are still hot, so that salt melts into them. Murillo is a traditionalist and sticks with salted seeds. But feel free to experiment. “A lot of chefs like to use a little nutmeg or cinnamon to get more of a sweet flavor for desserts,” he said. There are all types of patterns for creating your own jack o’ lantern designs. Use these freebies to enjoy.